I realise that I am extremely lucky often to be surrounded by very beautiful trees, of very different types according to where I am in the world. I can quite understand why people worshipped trees and why today, there are so-called tree-huggers. There is a majesty and serenity inherent in a large tree, something that dwarfs human presumptions and quiets one's fears. Their trunks tell of their capacity for endurance, adaptation and survival; their shapes tell of past influences of weather, treatment by man or animal, drought or abundance of rain and nutrients. This huge beech, growing in Givhans Ferry State Park in South Carolina, spoke to me insistently, in the cold spring light. 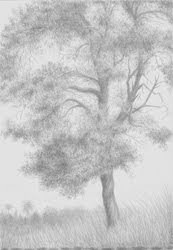 Before long, as I was drawing this in graphite, I was totally at peace, unaware of anything save the tree. Every time I find myself drawing or painting a tree, I remember a remark that Paul Cezanne apparently made: "Art is a harmony parallel with nature". In the case of trees, as wonderful representatives of nature, they help me achieve a degree of harmony and serenity that is a huge gift. When I perched uncomfortably on a very hard rock to draw this Aleppo Pine on Palma de Mallorca's outskirts, I was oblivious of the curious looks given me by people walking their dogs. I was somehow in harmony with this luminous tree that spoke of times when Palma was not such a sea of concrete.Drawing in silverpoint seemed appropriate for it had the same wonderful luster. This is another silverpoint drawing of an Aleppo pine, growing far up on the mountains above the city of Palma, where the view takes one far over the sea to the neighbouring island of Ibiza. The driving winds are shaping this pine, as it clings to the rocky mountainside. But it somehow seemed timeless. These rugged pine trees, growing on a windswept ridge in Brittany, were equally "eternal" in feel, as I sat in a ploughed, muddy field to draw them. Farmers were passing with huge trailers full of manure to fertilise their fields, and they gave me some very curious looks. The crows were calling far overhead in the soft luminously grey sky. It was a time when my art did indeed provide me a passport to a "harmony parallel with Nature". This quiet that comes to one as one works outside en plein air is especially magical. Nothing else seems temporarily to matter - just the dialogue between what one is trying to depict and one's hand working on the surface of the paper. Yet one hears bird song, the sound of the wind, different calls of humans or animals - but as a backdrop only. It is somehow a different experience to when one is deep in work in the studio, perhaps because of the vagaries of the weather and surroundings. Another aspect also comes into play when trees are the subject matter: they are intensely, logically complicated in their form and growth, and somehow one has to sort that all out, without depicting every single branch or leaf. Each type of tree is totally individualistic, and I liken drawing each one to doing a portrait of a person. Perhaps, however, one is more likely to be in harmony with trees than with a fellow human being that one is drawing or painting? Who knows!